I don’t know why the EKLAVYA THE ROYAL GUARD movie almost slipped by me. This film is directed by Vidhu Vinod Chopra, the director who did did one of my favorite Bollywood films MISSION KASHMIR (which was one of the first Bollywood films picked up and distributed by an American DVD company, because it was a great Bollywood flick). 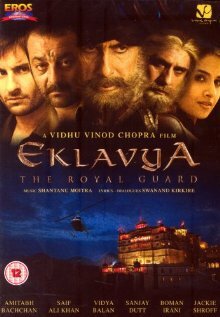 EKLAVYA was India’s pick for the Academy Awards foreign film submission in 2007. As a surprise, this is actually a great film, regardless of it being from India or not. First off, it’s not really a Bollywood film – it’s got one song in which a character asks a woman to sing a lullaby (not an out-of-the-blue song as they can tend to be in typical Bollywood movies), it’s less than 2 hours, the acting and storyline is like a normal non-Bollywood film (no grading curve for this flick as I curve most Bollywood films), no filler, no wasted scenes, and it’s actually one emotional flick. I’ve only shed tears for very few Bollywood/Indian films – such as Devdas, Dil Se…, Mission Kashmir, Fiza, Monsoon Wedding – and now I add Eklavya The Royal Guard. I’m not going to say whether it’s happy or sad tears…see the movie for yourself and find out! As I watched this movie, I felt like I was watching Ridley Scott do a film about Indian royalty. The cinematography, excellent use of sound and music (reminded me of the sound design of a Terrence Malick flick as well), lighting, action, and pace all felt like a Ridley Scott flick. This is one eye-candy film and I don’t mean beautiful to look at as in a Bollywood “look-at-all-the-pretty colors/costumes/sets” way but the visuals of the film are more like in the realm of Scott and Malick cinema. On the IMDB site, they show a poster of some critic comparing this film to a lost film of David Lean, which is also also a fair comparison. EKLAVYA THE ROYAL GUARD is exactly what I expected to see in China’s disappointing THE BANQUET and CURSE OF THE GOLDEN FLOWER. The small amount of action and the Shakespearean drama in this film is much better than those two cold, soul-lacking Chinese flicks. The action in this film is also much more beautifully choreographed than those two Chinese flicks. If you want to see a good Shakespeare-type triangle drama film with some action, go see this film. It’s a quality over quantity film. But overall, EKLYAVYA is a visually exciting, intense film from beginning to end. It doesn’t even matter that the film has few action scenes – those scenes are just a huge bonus to an already intriguing film. This is also Amitabh Bachchan (India’s Al Pacino) best acting in a film I’ve seen in a long time. He’s been just coasting and winging it in a lot of roles recently in his old age, but in EKLAVYA, he really shows off why he’s a good actor and not just an imposing screen presence. Usually he’s sort of cartoonish to me in all the Bollywood flicks I’ve seen. 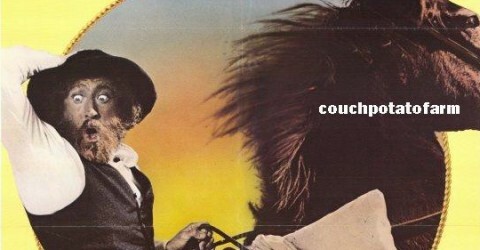 But in this film, he acts like a quiet samurai on the verge of exploding – it’s one great performance. That’s the thing about all these crappy Bollywood flicks. Most of these Bollywood films are so bad that you start to believe that most of the Bollywood actors are pretty bad. But once you see the rare good Bollywood film and see that these Indian actors can actually act if they are in the right film with a good director, it’s disturbing that they don’t do more good films. These respectable Bollywood actors seem to do three good films for every two hundred films they make. I bought the Eros Region 1 NTSC DVD version. The anamorphic video is very good. The only annoying thing about the DVD, as on all Bollywood dvds, is that a transparent Eros symbol pops in and out throughout the film at the upper corner of the screen. It’s no big deal if you are used to Bollywood DVDs. The DD 5.1 Hindi is excellent. This movie has a great sound design – with the constant background score and uses of surrounds during the knife throwing scenes and other action scenes. The English subtitles are excellent with no grammar mistakes. And the only extras are some trailers to other films. I highly recommend anyone seeing this film. I don’t recommend this film as a good “bollywood/Indian” film. I recommend this a good film, period. I didn’t read Jacques Tardi’s comic books till I was older. I remember first seeing his material in an underground comic book when I was a kid and thought they were pretty realistic, creepy, and nightmarish. I certainly was intrigued by his style but I didn’t read Adele Blanc-Sec until I was an adult. His artwork is excellent and he’s one of the best in the business of drawing beautiful women (I’ve seen his work in clothing stores when I’ve been in France and Italy), but I was always put off by the coldness of his style. So basically, I’m generally not a fan of his work or Adele Blanc-Sec. But Luc Besson has created an excellent live-action movie adaptation of two of Tardi’s books – Adèle and the Beast and Mummies on Parade. This film is one of the best live-action adaptations of a French comic book. 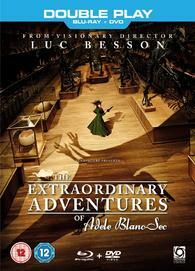 I not only think that this is an excellent adaptation, I prefer Besson’s movie version over the books. As I said before, Tardi is a bit cold. Besson has given the characters life and energy without compromising Tardi’s work. Those expecting tons of action like Indiana Jones and an army of mummies (as falsely advertised on the back of the UK blu-ray) will be disappointed. Just because Adele Blanc travels to Egypt and steals a mummy from a tomb doesn’t make her Indiana Jones – similar yes, but not Indiana Jones. She’s more like Sherlock Holmes and her comic books are more like Sherlock Holmes graphic novels. If anything, I would compare the movie more to Guy Ritchie’s Sherlock Holmes than to the Indiana Jones movies – only that this film is 100 times more exciting and more interesting than the Guy Ritchie film. The Limited Edition (yeah, right) Region B Steelbook blu-ray is a great blu-ray. The 1080p 2:35.1 image is beautiful – sharpness and and details are first rate. Actors skin and individual hairs have excellent clarity. Colors are rich and reproduced without flaws. The special effect characters merge pretty well with the rest of the film – the mummies look a lot better than the pterodactyl. The CGI character movement and perspective in relation to the real actors is very impressive. Blacks and whites are pure. Look closely at any scenes with the beautiful Louise Bougoin and you will know this is a very flattering-looking blu-ray. The French DTS-HD 5.1 is totally satisfying as well – the use of surrounds and bass effects for action scenes, backgrounds, and music are pretty much what you would expect from an action film as this. The audio really comes to life with the pterodactyl scenes swooping around and attacking characters all over the place. The extras are pretty good for a French film released on a UK blu-ray – plenty of interviews with actors, featurettes, “making of” which includes the involvement of the comic book creator, Tardi, who approved of this live-action adaption as well, and also a trailer.